When Newport Beach resident Sue Stern was diagnosed with a rare spinal cord tumor in 2008, she and her husband Ralph sought out the finest neurosurgeons in the region for treatment options. Their search ended when they met Dr. Mark Linskey and the UCI Health cancer team. Linskey successfully removed her tumor during a delicate, seven-hour surgery in which the slightest mistake could have left her paralyzed. Thanks to his extraordinary skill, Sue Stern, then 61, recovered completely. And give back they did. 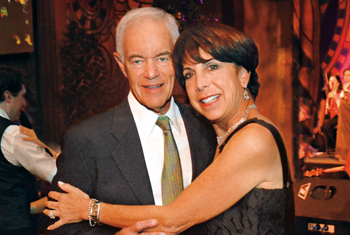 The couple recently donated $5 million to create the Sue and Ralph Stern Center for Cancer Clinical Trials and Research at the UCI Health Chao Family Comprehensive Cancer Center. The Sterns’ donation increases the ability of UC Irvine Health cancer specialists to sponsor clinical trials, which test the safety and effectiveness of potential new therapies on patient volunteers. For people with advanced-stage or treatment-resistant cancer, these studies can literally be a lifesaver. “With some new cancer drugs, participating in a clinical trial is the only way to access the treatment,” says Dr. Richard Van Etten, the cancer center’s director. Clinical trials also benefit the larger community by providing new knowledge about cancer. As Orange County’s sole university-based hospital, UCI Health has the only National Cancer Institute-designated comprehensive cancer center in the region and is in a unique position to lead the way in research. The Sterns have a special relationship with UC Irvine, having supported the humanities and other areas across the campus for the past 17 years. And since Sue Stern’s remarkable cancer treatment and recovery, they’ve also donated more than $600,000 to Linskey for his research on malignant spinal cord tumors and to Dr. Daniela Bota, a neuro-oncologist, to support her brain tumor research. For information about giving to the UCI Health cancer center, please call 714-456-6178.